The Lhasa Apso was first seen in Tibet at least 4,000 years ago and was bred and domesticated as early as 800 BC, which makes the Lhasa Apso one of the world’s oldest breeds. It is also considered the breed most closely related to the wolf. Originally the Lhasa was a guard dog for monasteries and the wealthy because of its distinctive and loud bark. It was a functional and practical animal, but soon became an ornament for the rich. 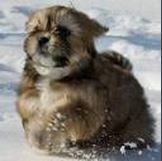 And in Tibet, a Lhasa Apso could only be given as a gift, but never sold. They were considered valuable and quite special. Lhasas have a double coat, which means that only the undercoat sheds – very infrequently – and so, while not considered hypoallergenic, they are often owned by people with other allergies. The Lhasa Terrier, as it was called in the early 1900’s, was brought to England by the British military who were coming home from India. In 1933 the first 2 American Lhasas were given to a C. Suydam Cutting as a gift by the 13th Dalai Lama. The American Kennel Club recognized the breed in 1935 as part of the Terrier group, but later moved it to the Non-Sporting group. In the United Kingdom, Lhasas are put in the Utility group. As the breed moved around the globe its features evolved to suit its new climates. The several changes occurred in the features of the head, the body structure and musculature, and hardiness. The lifespan of a Lhasa Apso can be as long as 14 years, but the breed is prone a several ailments, including skin issues, eye diseases including Progressive Retinal Atrophy(which can blind a Lhasa). Lhasas are intelligent people pleasers, who can be very affectionate, and easy to train. They may back off strangers and others they don’t know well, but they take to exercise with a great deal of discipline. Lhasas can be caring companions with big personalities for their small stature, and they like to know what is going on in the home at all times. The Lhasa Apso may be a bit more high maintenance than other breeds, but they are wonderful dogs for families with older children, and for adults. Its interesting history, and bred characteristics make it a loving and enjoyable companion.